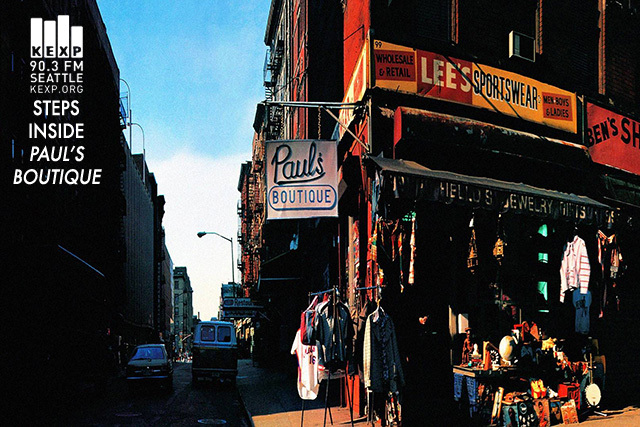 The beauty of independent radio still stands with the exploration of KEXP’s ‘Inside Paul’s Boutique’ tomorrow afternoon, (Friday, July 24th.) Check out the KEXP preview for the 6AM-6PM PST programming block…Delectable listening fun. They’re going to be digging deep with the album, playing all 15 album tracks, more than 100 sampled selections, and rare bonus tracks and demos, plus new interviews with album co-producers The Dust Brothers (John King and Mike Simpson) and an exclusive archival chat with the Beastie Boys aired throughout the day. And how can I forget? Check out this incredible resource for ‘Paul’s Boutique’ sample listings and background research. Get the speakers bumpin’ from the back of your Fleetwood.